I had come armed to youth group that night. My questions were a shield, a defense against the clarity of truth that I was earnestly trying to deflect. I’d been reading the Bible in an attempt to find a reason not believe in all the crazy things the Christians (aka freaky Jesus people) believed about Jesus. I was 17. I was angry. I didn’t want a God that called himself Father because if that was the case, then where the hell was He, I wondered? And what could Jesus really have to do with anything? I was walking the line with God and what a maddening, intoxicating time that was. Because I believed in something. I just wasn’t sure what I was going to do if it turned out to be this. It was my little sister who started it. She went by a church one day and they invited her in. So then, without even making sure that they weren’t a bunch of kool-aid wielding wingnuts, she just went in and gave them our phone number. As if people do that – but she did. It was the summer of 2000. And the freaky Jesus people Christians called and invited me to church when I picked up the phone instead, telling them that my sister was away for the summer, but that I might want to come. (With thoughts of homicidal juice in the back of my mind, and a pull away from the loneliness in my heart.) As if I did that. But I did. And I went. And I kept going. And I made some really unexpectedly amazing friends who bore no resemblance to wingnuts of any kind. Before I knew what was happening to me, I had started reading the Bible. Which lead to a lot of skeptical and probably very annoying questions for my youth pastor. Here I thought I was being clever. Because how could Jesus have said the thing about the cross before dying on one, if he even died on one at all? Answer me that. Then my youth pastor laid it out for me. Jesus was talking to people who knew the grief of the cross. People who wouldn’t have thought it was cute to put one around your neck as jewelry, because the way of the cross is the way of convicted criminals convicted to die a merciless death of unbearable torture and naked, crying shame. Following him meant fully giving up your life, your rights, and your dignity – and he meant for them to fully grasp this. Also – Jesus knew where he was going. He was making a prophetic allusion to what was coming. They wouldn’t know it at the time, but they’d remember it later. Would they ever remember it. And that’s when a simple question turned my heart. Jesus knew where he was going. HE KNEW. He knew the cross was coming all along and he kept going anyway. He carried it among them every day in his thoughts and heart, and then he carried it on his back to his death as he hung from it, bleeding out and suffocating into glory. This wasn’t imagery or metaphor. It was literal. He knew and He did it anyway. And He was calling them to pick up their cross and follow Him. He was calling me to that. More questions came, but they were different then. Instead of pouring over ancient words looking for a loophole, I was pouring over the Jesus story trying to figure out why. Why would He do that? I could get behind the idea of Jesus being a good man or a prophet or someone who points people to God or something, but taking the cross on purpose didn’t fit with my understanding of good man or prophet. So why then? Why would He do that? Months passed. I kept reading. I kept asking questions. I graduated high school. It was a year from when my sister first went by the church and gave them our phone number. I went to camp with the youth group and God took the opportunity to wreck me for Him upon arrival. He answered my question. It was simple. Jesus did it for everybody and for me. We throw around these big words like atonement and sin and transgression and reconciliation but that’s what He did on that cross. He knew what was coming and He did it anyway. For everybody, but for me too. Because I was lost, so lost, and He was looking for me to be found. My Dad carved this soapstone rock for me. 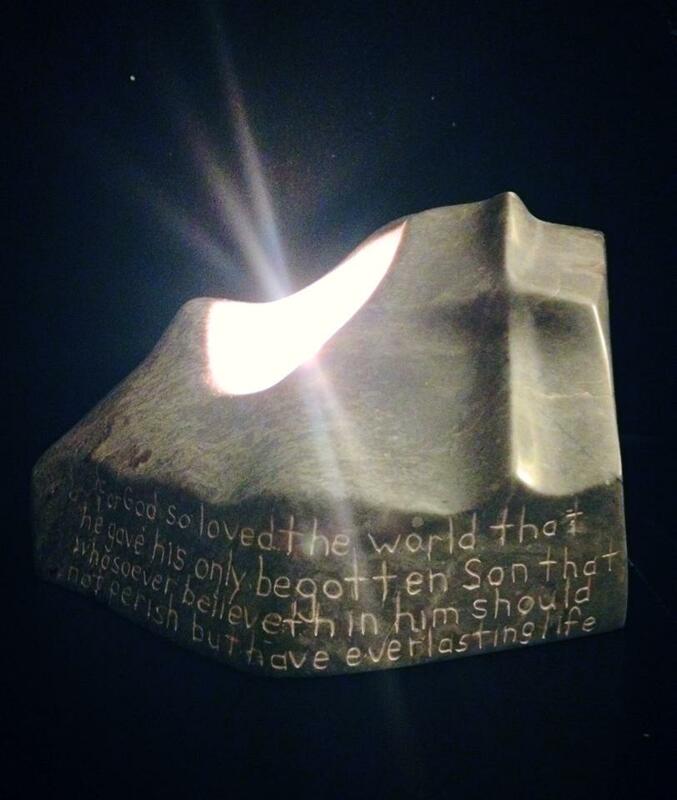 It has a cross on the front with the inscription of John 3:16 underneath – “For God so loved the world that He gave his only begotten Son that whosoever believeth in him should not perish but have everlasting life.” Inside the top is a tealight candle lighting it up. This is the God who was there all along and He showed me. He showed me where He’d been and what He’d been doing and it was glory and I was so, so wrong about everything. What a relief that was. Cue dramatic conversion experience on the floor of a camp building they called the Tabernacle. Picture less of a tidy sinner’s prayer and more of a repentant, ruined forever, ugly cry. Because Jesus saves, for real. Easter comes to the church calendar again and I think about that old question of mine as we focus on the Christ of the cross. As I think about His call for me to carry it too and follow Him. And it’s crushing a little bit, the weight of that call. I can’t do it. I can’t give up my life. Except that He says we must. So I do, even though I keep dropping it and trying to dress it up on a pretty chain when it really belongs square on my back. I pick it up again and again and I fail again and again. All the while knowing how the story ends and ultimately will begin. Knowing that like Jesus and because of Jesus, death will not be the end for me. After the cross and after dying to myself a million times until I really do die for real, I get to keep on following Him. Forever. Eternity is a long, long time and it starts with Jesus not even really being dead after all and neither will we be. It’s terrifying and mysterious and I am all in, rights and dignity be damned, I guess. Easter is Jesus knowing and doing it anyway. Easter is glory and I am undone. One Easter ago I wrote this. I wasn’t always a Jesus girl. Sometimes, like Peter, I find myself following at a distance until that damned rooster crows to remind me that I am undone, again. And again. And again. Easter is Jesus knowing and doing it anyway. Yes this truth is ridiculous and amazing. Thank you. That is so very special.